There are many MANY training plans available on the Internet and it took me a long time to find what I was looking for. In the end I took a Basic template and adapted it to suit my own lifestyle and needs. 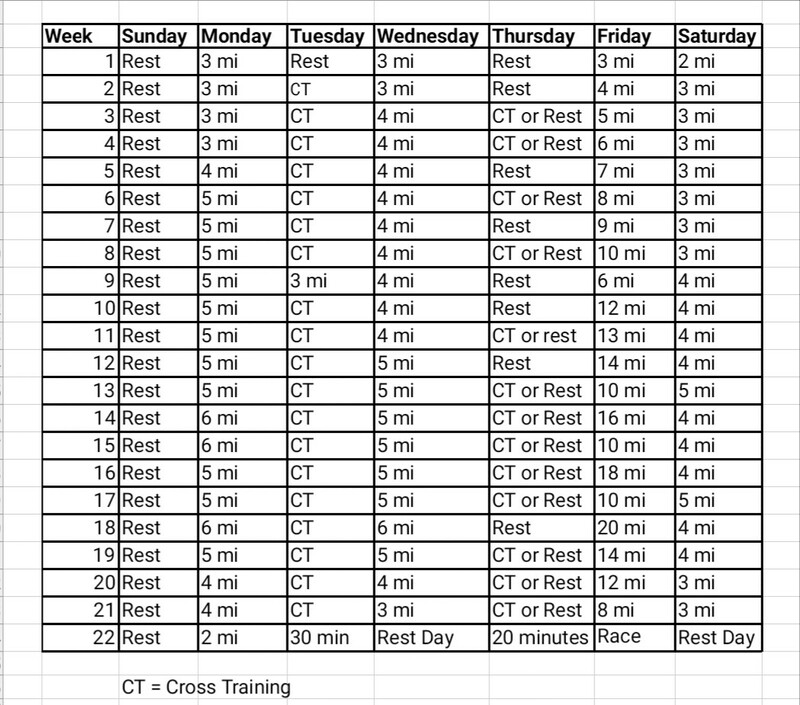 This would be a great plan for anyone who is relatively new to running or someone who wants to step up to the marathon. You should be able to complete a 3 mile run, 3 times per week. If your not able to do this then I’d either suggest using the couch to 5k (C25k) program or similar until you have the required stamina. One thing you may notice is that he long run is on a Fri, this is totally to suit my own lifestyle and can simply be moved to a Saturday or whichever day suits you best. I don’t need to add hill runs as I live on a huge hill and find it virtually impossible to find a flat route, if you don’t generally run on hills then I suggest making one of your runs a hill run. Do this by simply adding at least 1 good hill into your route. For cross training I personally will be doing swimming or cycling as well as some core stability work, however, you can choose anything so long as it’s at a steady level.